On the wrong side of 50, Father Ananda is now a senior Buddhist monk at the Wat Mahanet Monastery in Bangkok, but before opting for monastic life he had been a police officer for more than twenty years. The three earlier titles in the series are Mindfulness and Murder, Sister Suicide and Killer Karma. The books have been translated into French, German, Spanish and Italian. A movie based on Mindfulness and Murder was released in 2011 by DeWarenne Pictures in Bangkok, and nominated for Best Screenplay by the Thailand National Films Awards, 2012. 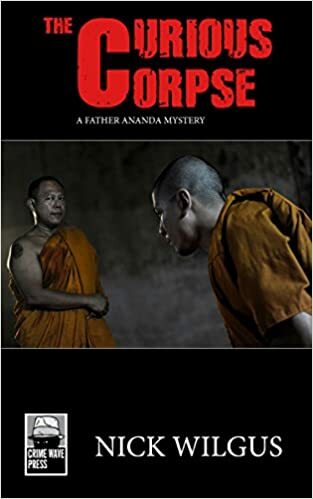 “The Curious Corpse finds Father Ananda matching wits with the Russian mafia. It begins with the discovery of a murdered Russian woman's body on the grounds of Ananda's temple. But things are not always what they seem and Ananda has a very hard time getting to the bottom of things. I've always felt that the Father Ananda books weren't just about Ananda, but the team of Ananda and his much younger sidekick, Jak. They are the two main characters in each of the books. They are each wounded in their own ways. They're a team, and they're a good team, but in The Curious Corpse, we see Jak beginning to grow up and coming to terms with the fact that life has dealt him a rather harsh hand. He is also experiencing some teenage rebellion. They have an interesting relationship that grows and develops with each book. Details: Books in the Father Ananda series are available in eBook and paperback, priced in local currencies. Crime Wave Press, will shortly be bringing out an omnibus edition of the first three titles.